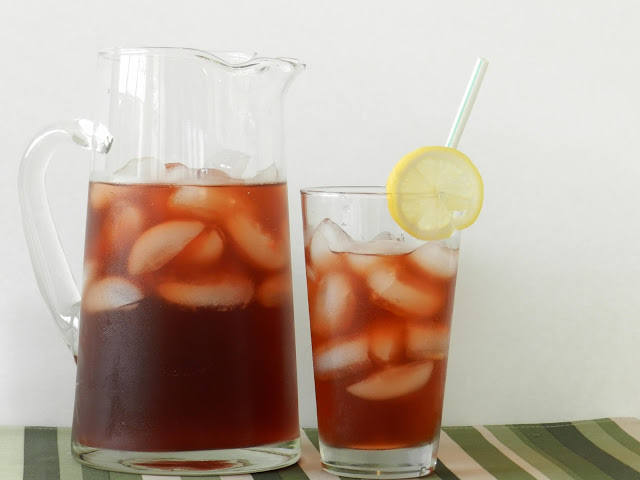 I almost feel silly writing a recipe for this, but I figure some people out there might really enjoy fresh brewed iced tea and not know how to make it themselves. It's super simple and can be modified according to your taste preferences. Place five tea bags in a heat-safe, 2-quart container. Boil water. Pour boiling water over teabags until container is 1/3 full. Let sit for about about 20 minutes. Remove tea bags and add ice and cool water. Sweeten and add lemon according to taste. If you like a stronger tea, use more tea bags. If you like it weaker use fewer, or brew less than 20 minutes. Tea can also be brewed for individual servings. Instead of a 2 quart container and 5 tea bags, use a very large mug and 2 tea bags. Fill another large cup with ice and pour tea over ice once it has cooled a bit. I got this idea from a friend of mine. So you see, iced tea is quite easy to make. Not to mention, it's very inexpensive. While I do like the convenience of grabbing a ready-made one while I'm on the go, making it at home for pennies is usually the best option.